I know more about growing mangoes than I'd like to. I live in a mango growing region... All my friends grow mango trees commercially! Actually, it's not that bad. The reason so many people I know grow mangoes is that mango trees are extremely easy to grow and manage. In the right climate growing mangoes takes no effort or attention at all. Through my friends I can get all the mangoes I want for free, and then some. But I still grow mango in my own garden, about a dozen different varieties. Mangoes come in different colours and sizes, have different flavours, and they ripen at slightly different times. Growing different mango tree varieties keeps things interesting, but most importantly it stretches out the harvest time of this feast or famine fruit. You can eat fresh mango for a few months instead of only a few weeks! What do mango trees look like? 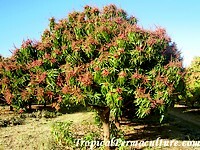 The mango is a very attractive, evergreen tree with glossy, dense foliage. The new shoots are reddish, the mature leaves a dark green. Depending on the variety mango trees can grow huge (to 35 m and 15 m across for seedling trees of older varieties). But you can keep a mango tree small by pruning it regularly. A mango tree in full flower is a sight to behold. The large pink panicles are at the ends of the branches and cover the whole tree. Oh, and they smell good, too! Where can you grow mangoes? Mangoes are a strictly tropical fruit. They love the tropics. The best climate to grow mangoes is frost free, with cool, dry winters and steamy, hot summers. Mangoes like growing in light and free draining soils, they don't need rich soil. You actually get the best crops on soils of somewhat lower fertility. Mango trees that were grown in a nursery are usually grafted and should fruit within three to four years. Seedling trees may take five to eight years. Seedling mango trees grow much bigger and stronger than the nursery trees and have an indestructible root system. If you buy mango trees in a nursery I suggest you don't look just for size and colour. Have you ever tasted the variety you are about to buy? Some mangoes taste awful... True. Some of the commercial varieties are bred for shelf life, size and looks, but are barely edible. 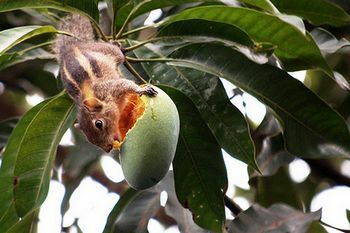 (Yes, I am totally spoiled when it comes to mangoes.) So, know the variety you buy! Secondly, if you plan to grow more than one mango tree, find out if it is an early or late fruiting variety. Don't buy three trees that all fruit at the same time. The most important step is the seed selection! If you take any old shop bought seed it may not grow true to type. The seed needs to come from what is called a "polyembryonic" variety. What that means is that the seed will sprout several identical trees. And those seedling trees will be identical to the parent tree. They are clones. Ideally you know the parent tree, it's from your area, grows really well and gets a bumper crop every year! If not, oh well. Get seed from a polyembryonic variety and at least you know that the fruit you harvest will taste the same. (The most common commercial variety in Australia, the Kensington Pride—also known as Bowen-—is polyembrionic. It's also a vigorous tree and usually fruits reliably, so it is well suited for seed growing. The best time to grow mangoes from seed is the beginning of the wet season (beginning of summer). Eat a nice mango, remove as much flesh from the seed as possible and then let it dry for a day or two. Or, if you prefer to fuss over them (or if you have only one seed but want half a dozen trees) then you can carefully cut a corner of the fibrous big seed. Cut only just deep enough so you can see the two halves of the seed, and then break it open. You can plant those mango seeds individually. They should take about ten days to sprout. I like to sprout my seeds right where they are to grow. That way I don't need to worry about hardening them off (getting a shade grown seedling used to full sun) or about transplanting shock. If you are worried about the little thing getting eaten, uprooted or trampled you can always put a barrier around it. 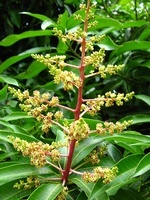 The best time to plant your mango tree is the beginning of the wet season (summer). The tree needs to be sun hardened. 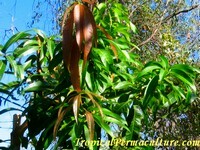 If your mango tree was grown in a shade house, gradually get it used to the sun first. Then dig a big enough hole. Carefully separate tree and pot without disturbing the roots. Put tree in hole, fill in, water. I mentioned at the beginning that mangoes need little care. It's true. 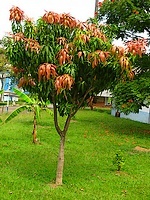 Young mango trees do benefit from regular watering and a little fertilizing until they are established. But don't love your mango tree to death. Overwatering can kill it, especially if your soil is a bit heavy. And too much nitrogen fertilizer will make it weak and sappy, all leaves and little fruit, susceptible to bugs and diseases. The older the tree gets, the less nitrogen it needs. Phosphorus and potassium are more important. Mulch your mango tree heavily and spread a bit of compost every now and then. If your soil is reasonable that should be all the tree needs. If the compost is made with wood ash, all the better. (Wood ash supplies potassium which will encourage fruiting and make the fruit taste better.) For mulch use only rough stuff like hay or lucerne, nothing that may mat down and become all soggy like grass clippings. 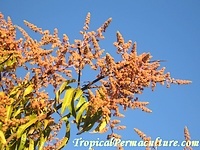 Fertilize mango trees in spring and summer only, and only a little at a time. A good way of helping the tree is foliar spraying with fish fertilizer or seaweed solution. It provides trace elements and avoids deficiencies, but it doesn't overfeed. But your best bet, even on very poor soil, is still lots of organic matter by way of compost and mulch. When the tree is one metre high, cut it back by a third so it branches. When those branches get to a metre, cut the tips off again. That should give you a nice shaped tree. You should also aim for an open crown, taking out whole branches if the centre becomes too crowded, so that air and light can penetrate. You can use pruning to keep your tree a manageable size and a nice shape. Mango tree growing too tall? Cut it down. Too wide? Cut it back. Pruning mangoes is not a science. In fact, the commercial growers here hire a big, scary machine with a long arm with three huge rotating blades. The machine drives along the rows and gives the trees a good hair cut so they all end up exactly the same height and width... You can do something similar by hand if you want to keep your tree a certain size. Usually mango pruning is done after harvest, though in some cooler areas the preferred time is just before flowering. Having said all that, after the initial cuts to encourage branching as mentioned in the previous section, you don't HAVE to prune a mango tree. If you don't mind having a real big tree, mangoes grow and fruit very well without pruning! Mangoes flower profusely and self pollinate very well. The flowering is triggered by cool nights. In the true tropics a severe cold snap will bring out masses of flowers. For us a severe cold snap is a night below 15°C. In years where it doesn't get so cold we end up with poor crops. Initially you may see masses of tiny mangoes on your flower panicles, but the tree will shed a lot of them and keep only what it can handle. So don't worry if you see a lot of them drop off. 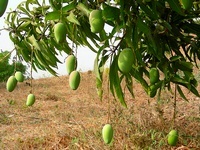 The mangoes will grow bigger and plumper, and eventually they will start to change colour. How long that takes depends on your climate. The hotter the weather the faster the mangoes ripen. 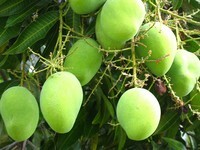 Usually your mangoes will be ready by the beginning of the wet season (late spring/early summer). Be careful when harvesting mangoes, don't get any of the sap on you. The sap can spurt from the fruit stem when it snaps off and can cause burns, allergies and dermatitis. It also burns the skin of the mango, which will go rotten at that spot. The best way to harvest mangoes is to cut them off with a long section of stem still attached, and to handle them carfully so that the stem does not snap off. 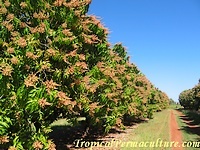 There are many newer mango varieties that show good resistance to anthracnose. Get one of those if you live in a climate with winter rains! Any other mango pests and diseases, like fruit spotting bugs and borers and whatever else is around, should be kept in check if you have a diverse permaculture garden that encourages beneficial insects. Can you grow mangoes indoors? Nope. But you can grow mangoes in pots! So if it is just a little bit too cold in winter where you are, you can buy a dwarf variety and grow it in a tub and bring it inside during the coldest time of the year. However, even a mango tree growing in a pot still needs lots and lots of heat and sun in summer. Growing mangoes indoors won't do!